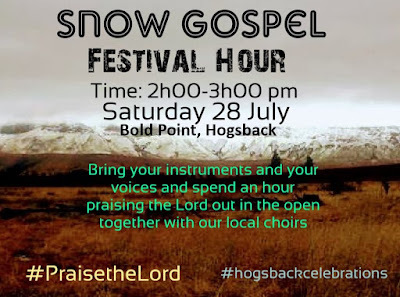 We are inviting EVERYONE to come and join our local communities, up here in Hogsback, at Bold Point, at the foot of the Elandsberg heart, to sing and praise the Lord, in the middle of the Hogsback Celebrations weekend programme. The Bold Point community will be cooking and selling food from 12 noon to 4pm to raise funds for their community hall. 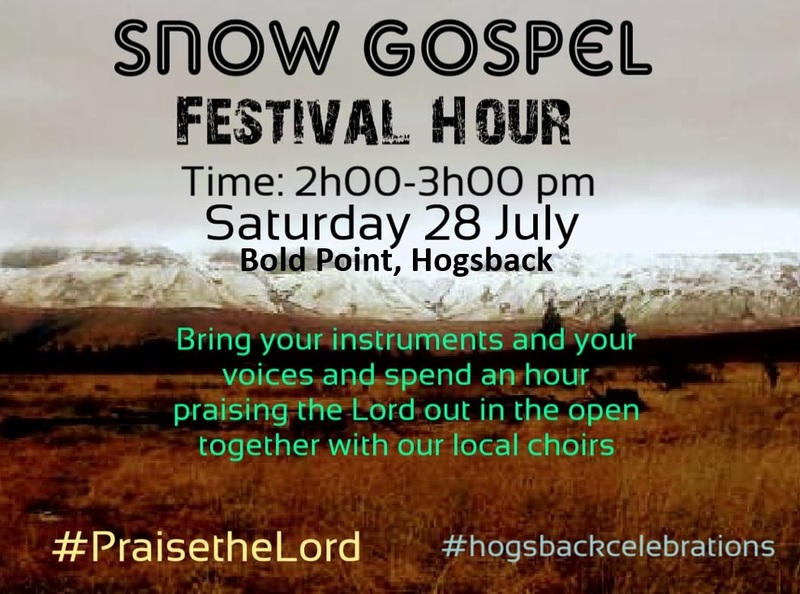 The little ones and the youth will be doing traditional dancing, gumboot dancing and storytelling from 1-2 pm, where after we will have an hour of worship singing from 2pm to 3pm. If God put this on your heart to come and join us, we would appreciate it more than you know. Even if you just keep this Celebration weekend in your prayers, that we all will be safe, and that God will be at the center of everything. It is very cold up at Bold Point so please dress very warmly. You can bring blankets/chairs to sit on and if you have spare blankets to donate to those who do not have, that will be wonderful as well. Maybe sweeties for the little ones will also be a fantastic idea. Bring your voices, instruments and if you would like to do an item that would also be “cool”. We are trusting God in this. There unfortunately is no more accommodation on the mountain, so it would be lovely if you could drive up and back on the Saturday. What do we want for our children; that they grow big and strong! So we want to take away hindrances. We want the same for the church. So we want to remove trials and temptations. They can hinder our spiritual growth by making us concentrate on the problem and not on God. But they can do the opposite and make us remember God! The Genesis story tells us why the world has thorns (Gen 3:18). It has fallen, and we share in that, so we have disease, problems, cancer and so on. Emphatically these are due to satan; God is good and tempts tempts no one (Jas 1:14). But they are allowed by God, but because they can result in good! One of these is the thorn, but note it is only a problem if it gets inside! Remember the apple; it did no harm until it was eaten. But we are prone to do so; in the flesh dwells no good thing, because we share in a fallen world. But temptation is not sin. Then Paul was not exempt. Emphatically, a thorn harasses, it slows, hinders, and so is bad. But does not kill. We are saved, the thorn does not take that away, but it affects our sanctification. Paul in danger of pride, because of what God had blessed him with. And he could not remove the thorn. Then his weakness allowed God to work. Sometimes our ability means that we hinder God. After all if we trust our ability, we are not trusting God – we cannot have two masters! Then our strength is made perfect in weakness, and that means it must be God’s work, we cannot be perfect. So in his affliction, “my grace is sufficient” - the thorn a gift! And gifts aid our service. It was grace, and so .undeserved. What do you do in trials? Firstly, prayer for removal! And so many just do not do that, and put up with the problems unnecessarily. The prayer of Paul was pleading, was persistent, repeated. It was in faith, and here the experience of Paul was a real blessing – he KNEW God. Secondly, if not answered, we know that God is allowing the trials for our good! Then remember 1 Corinthians 10:13, and that trials for a Christian must be temporary – we have assurance of heaven. Look to Jesus and all that He suffered, for out of that came blessing. The same is true for us – they are not so much trials – they are assets!